Manic Monday open mic 8.30pm till late. Wine deals £13.95. 50% OFF selected food items. Every Wednesday at Brig Below Leith Walk except 17 April, 10th & 17th July. Everyone loves a food festival they are good, edible fun and are a chance to try a load of interesting new and tasty things. But not all food fests are created equal, and Paisley’s Food and Drink Festival is one not to be missed. The Festival is one of the largest outdoor food and drink events in Scotland and takes place on Friday 26 and Saturday 27 of April. Tickle your taste buds at more than 40 traders and vendors, tasting sessions with Gin 71, a demonstration kitchen with celebrity chefs, including Masterchef – The Professionals 2016 winner Gary Maclean, kids workshops and the Renfrewshire CAMRA beer tent. You’ll also be able to enjoy a dedicated vegan and vegetarian zone, live entertainment all in the stunning grounds of Paisley Abbey surrounded by beautiful picnic areas prepped for all weather. Paisley’s Food and Drink Festival is a real showcase of Scotland’s vibrant street food scene and is a must see event in the Scottish event calendar – you would be nuts to miss it! In need of a night out? 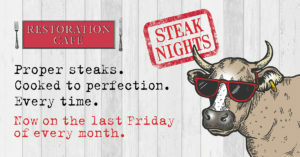 Restoration Café’s Steak Night is back by popular demand – and it’s bigger and better than ever. Slice into the best cuts of the finest Buccleuch Beef and enjoy a steak experience like no other, now taking place on the last Friday of every month. Buccleuch Beef is different to what you might have experienced in the past. The first thing you will notice is the rich colour – a result of the maturing process and a sign of superior flavour. The beef is traditionally matured for 28 days, giving it the unique Buccleuch attributes of flavour, tenderness and undeniable quality. Proper steaks. Cooked to perfection. Every time. It’s the perfect setting for date night, a family dinner or that much needed friends catch up. We’re taking bookings from 6pm to 8.30pm. For more information or to book, give us a call on 0131 322 2572 or book online using OpenTable. Passionate forager and a lover of the outdoors chef Paul Wedgwood will lead a group forage searching out the very best wild seasonal ingredients in the countryside near to his award winning restaurant on Edinburgh’s historic Royal Mile. 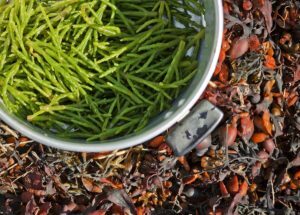 Wild foraging is the ultimate in “local” and “seasonal” produce and is guaranteed to reawaken your senses so you gain a greater appreciation of your environment and the provenance of ingredients. On this one-day course you’ll uncover a secret world of natural edible possibilities and discover how to identify edible leaves, fruit and fungi. After a morning in the wilds of Midlothian you’ll return to the restaurant to dine on a menu inspired by the mornings identifications. A basic run through of health and safety concerns, itinerary, and an introduction to foraging and its benefits to course participants. You will learn how to identify numerous wild edible plants and how to cook and prepare them safely; how to sustainably forage; and experience how foraging reconnects you to landscape and the natural world. After the forage you will return to the restaurant to enjoy a wild foraged lunch.